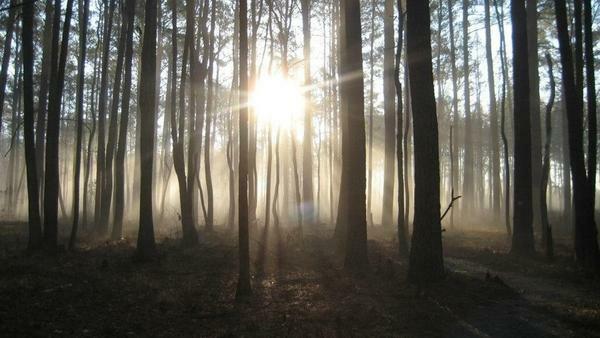 Great Dismal Swamp, in Virginia and North Carolina, was once thought to be haunted. For generations of escaped slaves, says archaeologist Dan Sayers, the swamp was a haven. Daniel Sayers has been working for more than a decade in Great Dismal Swamp; here, in 2011, he displays a fire-cracked rock from a dig site. His new book pieces together the stories of those who once lived in settlements scattered on patches of dry land in the swamp. Most Americans know about the Underground Railroad, the route that allowed Southern slaves to escape North. Some slaves found freedom by hiding closer to home, however — in Great Dismal Swamp. The swamp is a vast wetland in southeastern Virginia and northeastern North Carolina. In George Washington's time, it was a million acres of trees, dark water, bears, bobcats, snakes and stinging insects. British settlers, who first arrived in 1607, believed the swamp was haunted. By 1620, some of their slaves may have overcome that fear to find freedom there. Today, 112,000 acres of swamp remain, and archaeologist Daniel Sayers has explored many of them. He's found large islands where escaped slaves settled. "When you're walking through a thousand feet of the briars and the water, the mosquitoes are eating you alive, sweating bullets, and you're almost exhausted, and then suddenly your foot's no longer squishing in the peat but now it's walking on dry ground and crunchy leaves — it blows your mind," Sayers says. "You can't imagine people not living there." He's now written about life on these islands in a new book, A Desolate Place for a Defiant People. He believes 10 generations of escaped slaves lived here, along with Native Americans who'd been driven off their land and whites who were shunned by mainstream society. 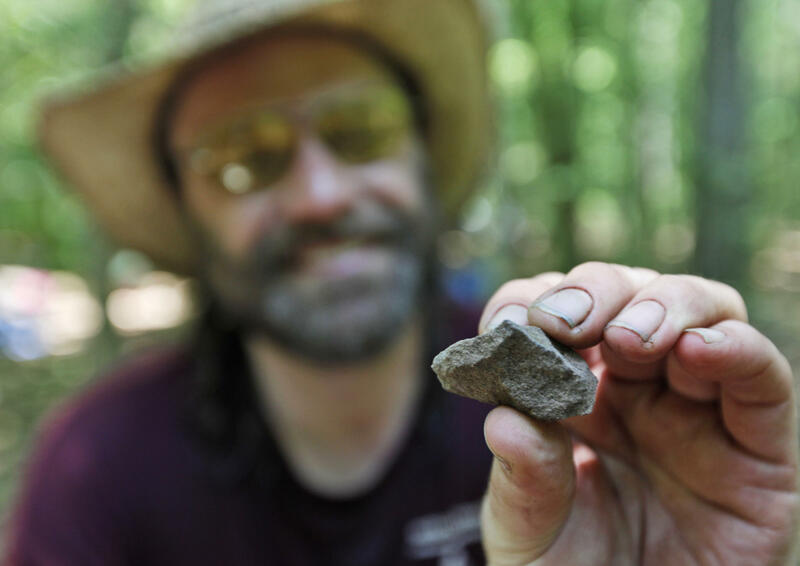 Since 2003, he's found thousands of artifacts during Great Dismal Swamp digs. In his laboratory at American University, he unwraps several: bits of clay tobacco pipes, nails and traces of at least a dozen cabins, along with what could have been an arsenal — a place where Sayers found gun flints and lead shot. "Make no mistake about it. These were resistance communities. They weren't going out there because they loved swamps," he says. "They were going out there because they were living in a very brutal and oppressive world of enslavement and colonialism." News of these finds is exciting for professional and amateur historians like Eric Shepherd, a resident of Suffolk, Va., who organizes tours to help African-Americans get in touch with their roots. "As our ancestors are calling us to look for them, I think we ought to pick up the spiritual phone and answer the call," he says. Research led Shepherd to a distant relative named Moses Grandy, who left an account of his time in the swamp around 1800. He first went there to dig canals so his master could cut and transport timber. "The labor there was very severe," Grandy wrote. "The ground is often very boggy: the negroes are up to the middle or much deeper in mud and water, cutting away roots and baling out mud: if they can keep their heads above water, they work on. ... [The overseer] gave the same task to each slave; of course the weak ones often failed to do it. I have often seen him tie up persons and flog them in the morning, only because they were unable to get the previous day's task done." Grandy was skilled at handling boats, and sometimes his master allowed him to work for others, sharing the money that he made moonlighting. Over the years, Grandy saved enough to buy his own freedom. He could have headed north. Instead, he returned to live in the swamp. "I built myself a little hut, and had provisions brought to me as opportunity served," Grandy wrote. "Here, among snakes, bears and panthers, whenever my strength was sufficient, I cut down a juniper tree, and converted it into cooper's timber. ... I felt to myself so light, that I almost thought I could fly, and in my sleep I was always dreaming of flying over woods and rivers." "Slavery will teach any man to be glad when he gets freedom," Grandy wrote. Such stories, along with some of the artifacts Sayers found, will be on display at the Smithsonian's National Museum of African-American History and Culture when it opens in 2016. Copyright 2014 WVTF Public Radio. To see more, visit http://www.wvtf.org. 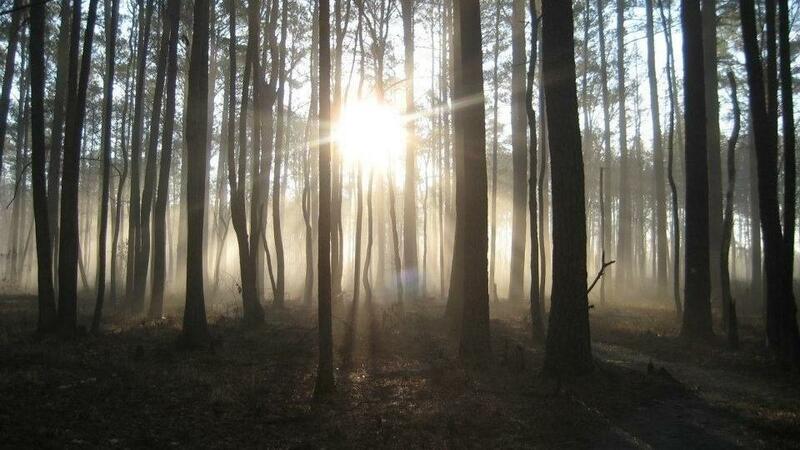 The Great Dismal Swamp, which stretches across two southern states, played an important part in our nation's history. Escaped slaves used the area as a hideout for many years. From member station WVTF, Sandy Hausman reports. SANDY HAUSMAN, BYLINE: The Great Dismal Swamp is a vast wetland in Southeastern Virginia and Northeastern North Carolina. In George Washington's time, it was a million acres of trees and dark water, bears, bobcats, snakes and stinging insects. British settlers, who first arrived in 1607, believed the swamp was haunted. But by 1620, some of their slaves may have overcome fear to find freedom here. Today 112,000 acres remain, and archaeologist Dan Sayers has explored many of them, finding large islands where escaped slaves settled. DAN SAYERS: When you're walking through 1,000 feet of the briars into the water, you know, the mosquitoes are eating you alive, sweating bullets, and you're almost exhausted. And then suddenly your foot is no longer squishing in the peat, but now it's walking on dry ground and crunchy leaves. It blows your mind. You can't imagine people not living there. HAUSMAN: He's now written about life on these islands in a new book "A Desolate Place For A Defiant People." He believes 10 generations of escaped slaves lived here, along with Native Americans who'd been driven off their land and whites who were shunned by mainstream society. In his laboratory at American University, he unwraps several artifacts from a collection of thousands he's found during Great Dismal Swamp digs that began in 2003. There are bits of clay tobacco pipes, nails and traces of at least a dozen cabins along with what could have been an arsenal - a place where Sayers found gun flints and lead shot. SAYERS: Make no mistake about it, these were resistance communities. They weren't going out there because they loved swamps. They were going out there because they were living in a very brutal oppressive world of enslavement and colonialism and all that. 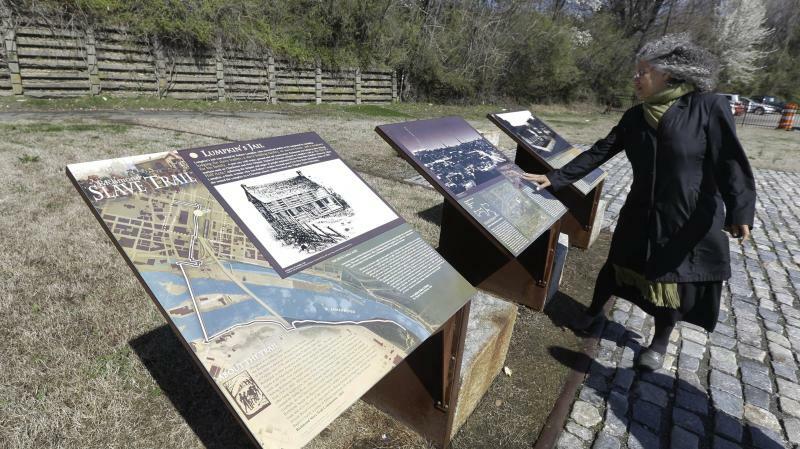 HAUSMAN: News of these finds is exciting for professional and amateur historians, like Eric Shepherd, a resident of Suffolk, Virginia who organizes tours to help African-Americans get in touch with their roots. ERIC SHEPHERD: As our ancestors are calling us to look for them, I think we ought to pick up the spiritual phone and answer the call. HAUSMAN: Research led Shepherd to a distant relative named Moses Grandy, who left a graphic account of his time in the swap around 1800. He first went there to dig canals so his master could cut and transport timber. Shepherd reads from Grandy's narrative. SHEPHERD: (Reading) The labor there was a very severe. The Negroes up to the middle are much deeper in the mud, cutting away roots. The overseer gave the same task to each slave. I have seen him tie up persons and flog them because they were unable to get the previous day's task done. HAUSMAN: Grandy was skilled at handling boats, and sometimes his master allowed him to work for others, sharing the money he made moonlighting. Over the years he saved enough to buy his own freedom. He could've headed north. Instead he returned to live in the swamp. SHEPHERD: (Reading) Here, among snakes, bears and panthers, I built myself a little hut and had provisions brought to me. I felt to myself so light that I almost thought I could fly. And in my sleep, I was always dreaming of flying over woods and rivers. Slavery will teach any man to be glad when he gets his freedom. HAUSMAN: Such stories and some of the artifacts found by archaeologist Dan Sayers will be on display at the Smithsonian's National Museum of African-American History and Culture when it opens in 2016. For NPR News, I'm Sandy Hausman. Transcript provided by NPR, Copyright NPR. On a warm spring night, more than 150 people gathered in Shockoe Bottom, a name taken from the Native American word for a site in Richmond, Va. This part of town, bounded by I-95 and bisected by railroad lines, was central to a city that prospered from the slave trade. "The best guesstimate is several hundred thousand people were sold out of Shockoe Bottom," says Phil Wilayto, a leader of the grassroots movement to establish a memorial park here. "Probably the majority of African-Americans today could trace some ancestry to this small piece of land." All this week, WUNC's Leoneda Inge is working with a team to re-construct a slave cabin that dates back to the early 1800s. The cabin is on the grounds at James Madison’s Montpelier in the Piedmont region of Virginia. The remains of the original slave cabin was discovered and excavated in 2010. Leoneda and the team will be helping to rebuild the slave quarter at the actual site where it stood generations ago. She'll be blogging all week. We will excerpt her blog here and link to each day's entry. Well, the South Carolina-based Slave Dwelling Project is counting and so is the National Trust for Historic Preservation. Archaeologists at James Madison’s Montpelier estate in Virginia set out to locate where slave cabins once stood on its property. And last week, a group of people helped re-build a part of that history.